In the wake of NATO Secretary General Jens Stoltenberg’s visit to Washington last week, the question arises of how politically vulnerable the alliance is. It has endured through nearly half of U.S. President Donald Trump’s first term, but there is a dangerous dynamic underway that could yet undermine it from within. Recall that the Soviet Union disintegrated for internal political, not external military reasons. Should NATO follow that path, it would be the gravest setback to American security since the end of World War II. It would hand the ultimate prize to Russia’s Vladimir Putin. Trump’s impetuous behavior has created much of this risk. His call for greater European burden-sharing has merit. But his unruly demeanor is having consequences. 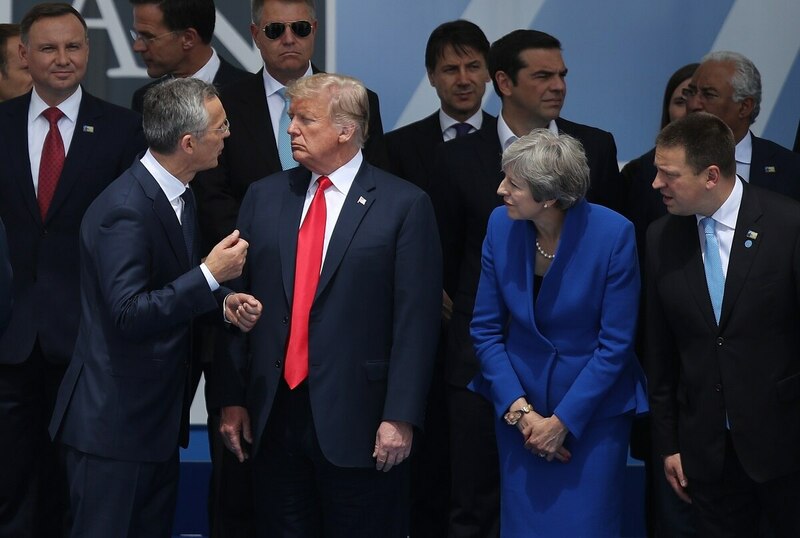 Personal attacks on other NATO leaders, disruption of the G7 and NATO summits, and public reticence about America’s defense commitments have undermined America’s leadership role. He has equated the European Union as a foe alongside Russia and China; used national security as the rationale for imposing punitive tariffs on allies; embraced autocratic leaders; and disregarded European concerns ranging from global warming to the Iran nuclear deal. The other half of this dangerous dynamic is European overreaction. Public confidence in U.S. leadership is under 20 percent in most European countries. European political leaders increasingly challenge not just American foreign policy, but they question American values and commitment. European defense intellectuals increasingly talk about the need for “strategic autonomy” and for a “Plan B” independent European defense posture should the United States abandon the alliance. Two factors continue to hold the alliance together, despite political cleavages. First, Europe has so neglected its defenses that without the United States, it is militarily vulnerable to an increasingly assertive Russia. Russia holds conventional military advantages geographically and in terms of readiness that only the U.S. can offset. Without U.S. nuclear weapons (and with the United Kingdom leaving the European Union), Europe would need to rely on the modest French nuclear force to deter a much more powerful Russian nuclear capability. And Europe itself is in political disarray. So a viable European Plan B is impossible to implement for perhaps a decade. True strategic autonomy remains for now an illusion. And second, despite Trump’s posturing, NATO still enjoys very strong support in Congress and among the American people. Congress has passed resolutions stressing the importance of NATO, and the Senate Foreign Relations Committee just held hearings highlighting its value. Both sides of the Atlantic now need to practice strategic patience to manage alliance affairs as the United Stated deals with its own political future. Continued Euro-bashing from Washington will only further alienate European leaders. Premature European efforts to seek an independent Plan B risk creating a self-fulfilling prophecy. On this side of the Atlantic, leaders need to recall what Sen. John McCain instinctively knew: that NATO’s importance to U.S. security far outweighs the burden-sharing imbalance. The Sen. John McCain Memorial NATO Building doesn't seem to be in the cards. NATO has provided the secure base for European political unity and deterred Moscow for seven decades. The terrible costs of two world wars have so far not been repeated. European defense spending increased about 5 percent last year. Europe has contributed its fair share to NATO operations in Afghanistan, Libya, Syria and at sea. The United States has 28 main operating bases in Europe, which allows it to conduct military operations globally. It has access to valuable information gathered by European intelligence agencies. Losing the alliance would translate into “America Alone” in a complex and dangerous world. On the other side of the Atlantic, Europe needs to fasten its seatbelt and ride out the storm. Trump’s dismissive attitude toward NATO does not represent Republican opinion, let alone American opinion. Overreaction to Trump will only deepen NATO’s troubles. Instead, Europe should just focus on building military capabilities and continue to connect with a broad array of American leaders, as Stoltenberg just did. Both sides of the Atlantic need to develop the vision of a more balanced alliance for the next decade. In a more balanced relationship, Europe should be capable of conducting several small, joint military operations independent of the United States, and contribute at least half of the firepower needed to defeat a major adversary, but all in the context NATO. Setting an alliance “level of ambition” like this could defuse trans-Atlantic tensions and maybe even convince Trump that the alliance is not obsolete. Hans Binnendijk served as senior national security council director for defense policy in the Clinton administration. He specializes in European security.